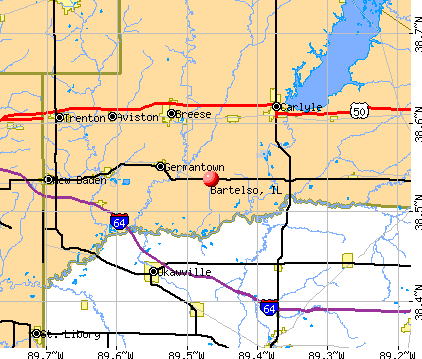 Bartelso is a small town located along Highway 161 in southern Clinton County. It is approximately 40 miles east of St. Louis, Missouri. Bartelso is "Home of the Braves". Our school mascot is proud to sponsor over 133 students from Kindergarten through 8th grade. Bartelso School District No 57 promotes the latest educational trends with the help of their newly updgraded technology room and qualified staff. The residents of Bartelso are friendly, hard working, and will always give a neighbor a helping hand. They continuously work together to make it happen. Whether its support for the volunteer fire department, school, community organization or a family in need, they are always there to provide the necessary help. There is always plenty to do around town. Our park is complete with a softball and baseball diamond and is the home of the Annual Bartelso Bash Softball Tournament. In addition, it provides several playground areas, picnic shelters, tennis courts and batting cages. You also can always find delicious food and alot of fun at MacJenna's Restaurant, KofC Bowling Alley, Johnny B's, Hondo's Bar & Grill, or Larry's West End Tavern. We hope you'll find Bartelso your new place to call "Home". If you have any further questions about Bartelso, please feel free to contact the Mayor, Jack Wilken.